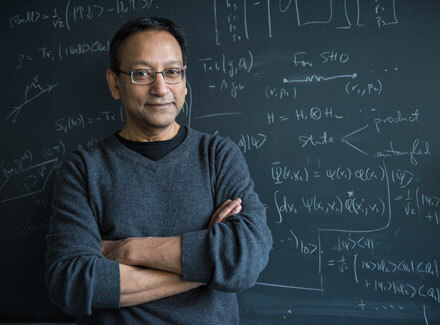 Viqar Husain, a professor in the department of mathematics and statistics at the University of New Brunswick Fredericton (UNB), has been researching the structure of spacetime for a number of years. His latest paper on the subject has been accepted for publication in Physical Review Letters and could affect future research on the structure of space and time. Dr. Husain’s research in this paper considers the question of whether the deep structure of space and time violates Einstein’s Special Theory of Relativity. “Our paper shows that, if this were the case as postulated by some theories, the effects would be large and detectable in existing laboratories,” said Dr. Husain. Dr. Husain compares the topic of study to an airplane flying over the ocean. From the sky, the water looks calm and flat, but as the plane gets closer the waves are visible and frothy. For the plane to get close-up view from the sky without approaching the water, it would require powerful binoculars. “Viewed close up it is believed that spacetime too is frothy, due to the same quantum fuzziness we know exists in atoms. How closely must we look before we see this spacetime foam? The answer is very tiny, and known as the Planck length. In centimetres it is a decimal point followed by 32 zeroes, followed by a one." The question that Dr. Husain and his collaborator, Jorma Louko of the University of Nottingham (UK), asked is whether this microscopic graininess of spacetime can be visible in the macroscopic world. The surprising answer is yes. “It turns out that if the graininess is a particular type, we should have already seen it. We’re ruling out a particular kind of spacetime graininess,” said Dr. Husain. The study’s results were unexpected for Dr. Husain. There is a large body of research that uses microscopic violation of Einstein’s Special Theory of Relativity, but no other researchers had considered whether this could be seen macroscopically in atomic particle detectors. Drs. Husain and Louko thought the effect would be tiny, but it turned out to be substantial. That is why their work is considered important for future research. Dr. Husain doesn’t see an end to this research, either for himself or others in the field. They can now investigate what other models there are of microscopic structures.